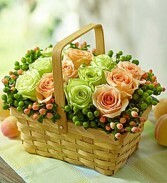 FRESH PICKED... JUST FOR HER! 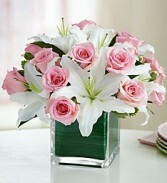 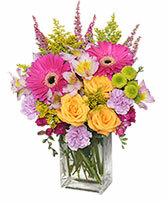 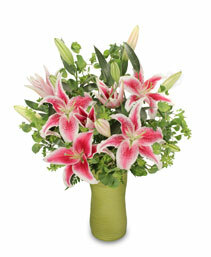 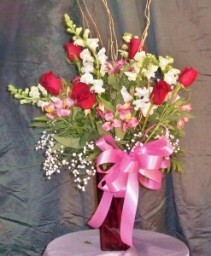 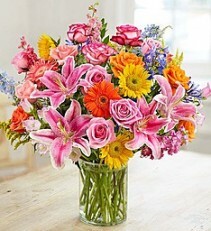 Cm Freedom Roses, Snaps White Or Blush, Alstroemeria Lilies Pink Or White, Babys Breath Around The Base, Pink Bow. Long stemmed Freedom roses are nestled into snapdragons and alstromeria with a corona of baby's breath, all in a ruby red vase with a beautiful pink bow. Vased for longevity, this is a very special gift. Prange's exclusive, order today! 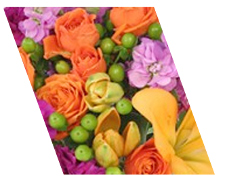 As Basket Full Of Roses, Splitwood Handled Basket, Small, Block Wet Foam, Peach Roses, Green Roses, Green Hypericum Berries, Peach Hypericum Berries. 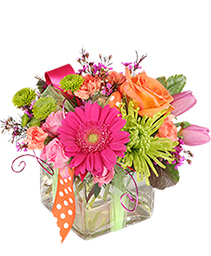 This delightful design is reminiscent of the Farmer's Market baskets filled to the brim with beautiful blooms and berries Included are two colors of rose, along with two shades of Hypericum berries, all set in a natural split wood basket. 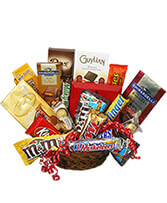 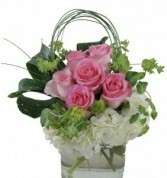 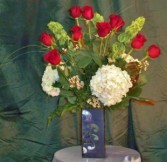 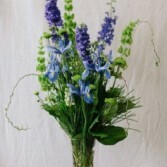 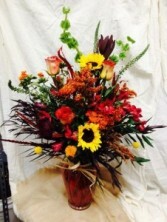 Also available in other shades, Call us today to order your special Market Basket. 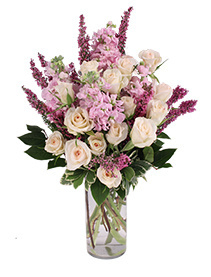 Marquis Vase Or Similar, Pink Roses, Red Spray Roses, Hawaiian Sunset, Salal Tips, Other Foliage As Necessary, Not Leatherleaf Or Italian Ruscus. 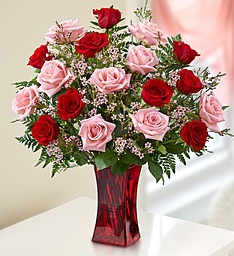 Lovely premium pink roses and delightful crimson red spray roses combine with tropical foliage "Hawaiian Sunset" in this distinctively elegant presentation. 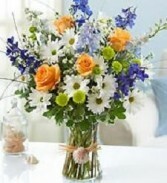 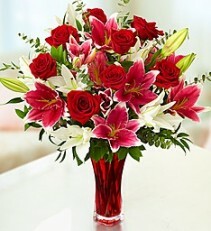 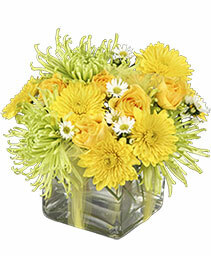 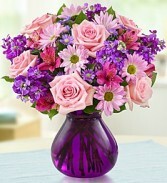 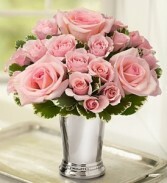 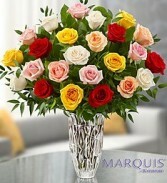 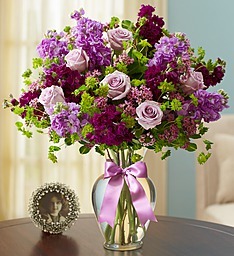 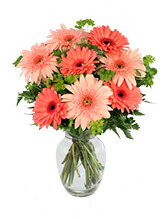 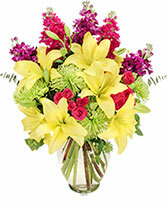 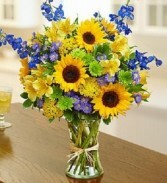 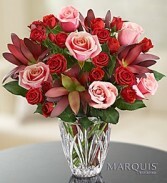 Shown in the classic hand-cut crystal vase (Premium, $119.99). It is also available in a lovely garden vase (Standard, $89.99).